A classy sky blue necktie in XL Length especially made for the big & tall man. The fine cross-pattern in the tie gives this tie a slightly less formal look when compared to a light blue tie made from smooth and shiny silk. It is a prefect tie for business in the spring and summer in combination with gray, navy or tan colored suit. This extra long necktie measures 61" in length and is especially made for taller men. If you have difficulty tying a regular sized necktie to the right length, than extra long neck ties are right for you. Typically, extra long ties are recommended for men taller than 6'3". Extra long tie made from 100% silk. 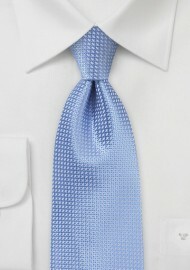 Length: 61", Width: 3.25"
This tie is also available as regular sized Solid Light Blue Tie.